Sugar free muffins? Sugar free? Yup, that got your attention didn’t it. Well, it’s true – it is actually possible to have a delicious teatime muffin that doesn’t taste like pappy diet food, has no added sugar and is REET GORGEOUS. Ok, so purists among you might point out that having dried fruit and mashed banana in the mix still constitutes ‘fruit sugar’ but what I’m talking about is that these wonderful cakes have no refined sugar, honey, agave nectar, molasses or anything like that in them. Which makes ‘em rather virtuous and also perfect to give to whining toddlers without causing a Hiroshima-style mood explosion. And guess what, to make them extra moist, I’ve added grated MARROW. Uh-huh. And you could also add grated courgette or apple in its place, if you don’t have access to a marrow. Adding grated veggies makes for a really moist cake, plus it’s quite a nifty way of force feeding veggies into a two-foot terrorist (two-year-old). I used to hate that word, ‘moist’, it used to make my skin crawl. But to describe a cake, it’s a word that becomes bearable. 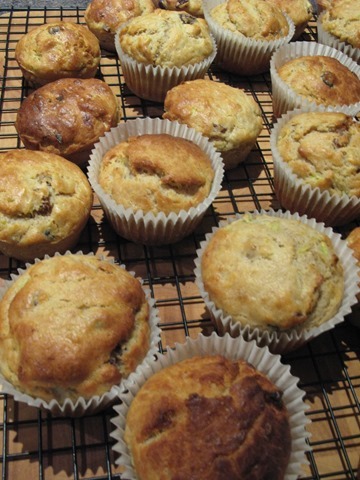 I think the reason that these muffins work so well and that you don’t miss the sugar factor is that there is a generous amount of vanilla extract in the recipe, as well as a good hit of spice – both which work well at distracting you from wanting more sugar. And to be honest, the raisins and mashed banana make them sweet enough. I ate four of these muffins today. I FEEL GREAT. So easy, this: all you do is roughly whisk up the eggs and vanilla essence by hand in a large bowl. In a separate bowl, mix together the mashed banana, grated marrow and dried fruits. Let them hang out together for about 10 minutes – that way, the dried fruits will soak up all the liquid from the grated veg and become nice and plump. Then chuck the fruit/veg mix in with the egg/vanilla mix, then throw in all the rest of the ingredients. Don’t bother sifting the flour. Mix together with a spatula until well incorporated, but don’t go crazy. Ta-da, your mixture is ready to bake. Spoon out into muffin cases (it’s best if you use a muffin tray) and bake for 20 – 25 minutes at 180C, until lightly browned on top and a skewer comes out clean when you pierce the cake. 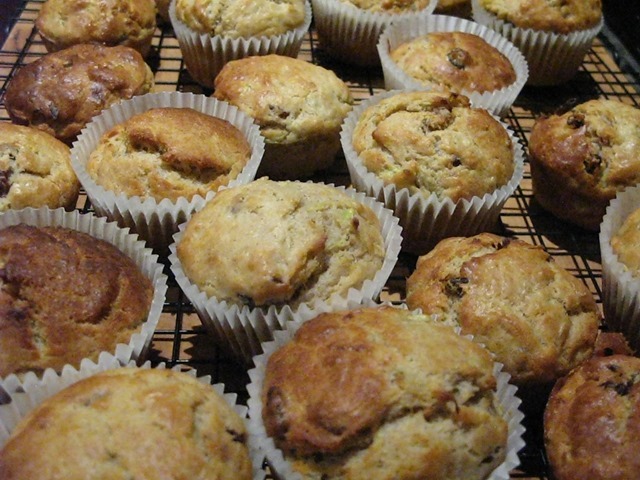 Aaaah – a sea of muffins! Happy little fellows! Great idea. I’ve churned out about 2398 banana cakes since the Bean was born, but I’m getting bored of the recipe PLUS it has sugar in it. Bean is getting ever more demanding and sugar-crazy. She woke up yesterday by yelling I WANT CHOCOLATE at me! So anything that will ‘fill the void’ in a wholesome manner is much appreciated. Ha – she knows about the good things in life, eh? I bet she will love these – and hopefully the lack of added sugar will ensure she doesn’t turn into a raving loony by 3pm! Thanks! This is perfect for me cake-hungering diabetic partner. Hope you both enjoy ’em! Seriously, no sugar is needed and you won’t miss it.